I am nerdy excited about these little cards. Most, if not all of my friends are foodies of sorts. In fact, when I used to work at Johnson’s Backyard Garden some of us would try to come up with cute veggie sayings and jokes. I have been wanting to make cute little cards like these for a long time. I find that most Hallmark cards are too cheesy and some locally made cards are just a tad too snarky. I am not too particularly concerned if anybody even buys these at the Bluebonnet Bazaar this coming Saturday, because to be honest, I will use them all! Anyway, the images are prints or watercolors/drawings that I have done. I hope you like! 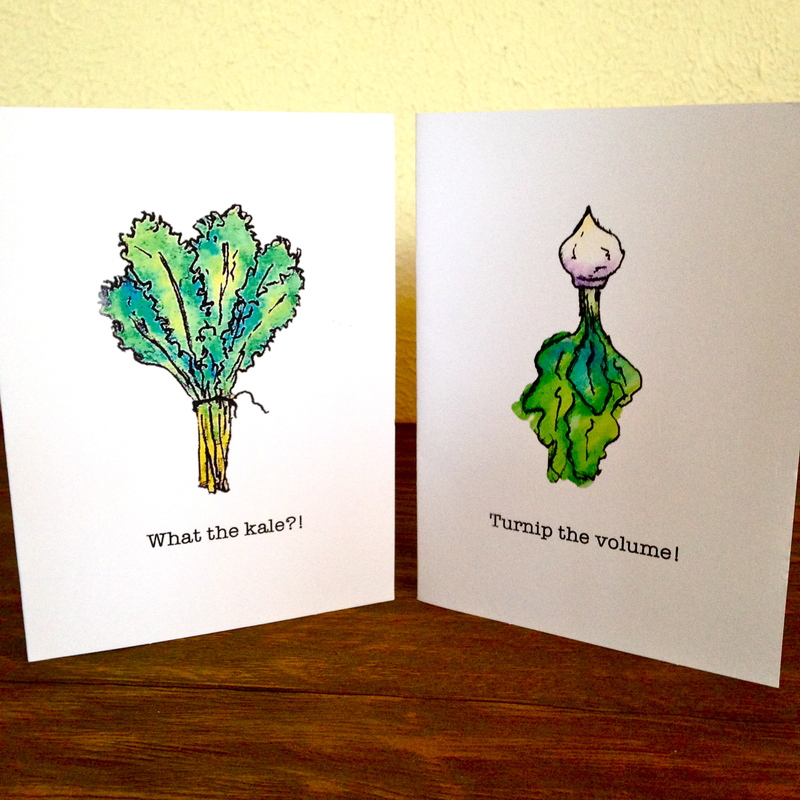 Turnip the volume! : Happy Birthday! Can’t beet a friend like you! : Thank you! you light up my life: Happy Holidays! It is no secret that I love beets. I love them pickled, roasted, fried, and tattooed on my leg, boiled, you name it. Beyond the delightful taste, the brilliant colors have always been something that has gotten me too. I don’t even mind my hands being pink for days. So now that beets are in season, it should be no surprise that I am picking them up at the farmers market like they are going out of style. This past Sunday, I stopped by the Johnson’s Backyard Garden booth and loaded up on about 5 pounds of beets in order to whip up a batch of my Lemon and Clove Pickled Beets! I find that beets are always on the sweeter side when they are pickled, because of the amount of sugar that is in them naturally. I like to play off of the sweetness with a little bit of tartness from the lemon and the slightest spice from cloves. Cloves and lemon can both be tricky because a little bit can go a long way, not to mention, paired with the wrong beet, it can turn into a bitter situation. 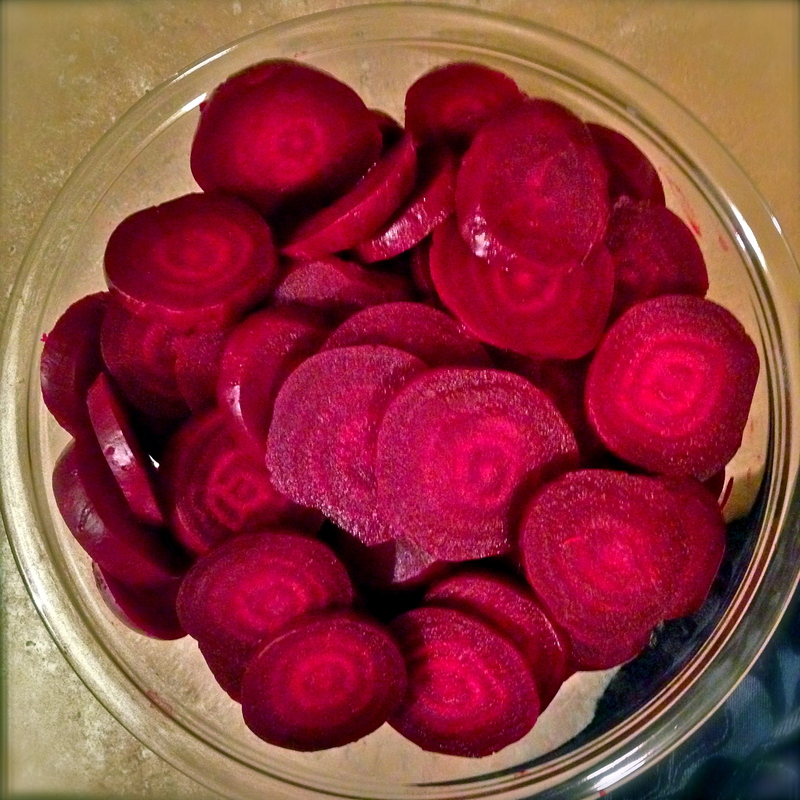 I find that this early in the winter season, the beets are perfect: small and sweet. These pints will be available at the Bluebonnet Bazaar on December 13th! They are great in salads and sandwiches (think peppery arugula and goat cheese) or just right out of the jar! 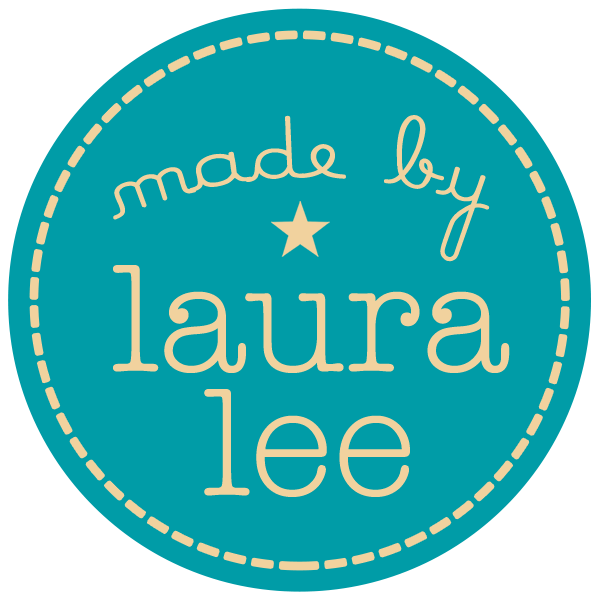 For more information on the Bluebonnet Bazaar: Click here!